Cheesecake? Where does it come from? What is its origins? Cheesecake has been enjoyed throughout the centuries, it is believed to have been served to the first Olympians in 776 BC!! It is almost a worldwide phenomenon with variations everywhere. Cream cheese was created in the USA in 1872 , it was an attempt to re create the French cheese Neufchâtel . Various others similar cheeses were also created at this time. Depending where you are the choice of cheese for cheese cake varies. In the USA and Canada it is nearly always cream cheese, in Italy -Ricotta, in Germany, Holland and Poland it is Quark ( a cross between cream cheese and plain yoghurt) and in France , Neufchâtel . The way they are made also varies around the world, some are baked, some have a biscuit crust and some a pastry crust. Some are set ( using gelatine) and unbaked . Some, most, are sweet, but some are savoury , as in smoked salmon or goats cheese with beetroot. I asked my Japanese friend the other day, as I had seen in an American publication something called “Japanese Cheesecake”! She laughed and told me, No, No, No, we love cheesecake but it is not something we make ! Apparently Heston Blumenthal has declared that Cheesecake is an English invention, not sure where that came from, as far as I can see it was the Greeks! So, onto yet another very very easy cheese cake, that has no base and is a cross between a cooked chocolate mousse and a cheesecake! Icing sugar for dusting and raspberries for decorating. Use a 9″ Spring form pan, heat the oven to 170C/325F Mark3 on a gas oven. Grease the pan using a paper towel and some olive oil. Melt the chocolate either in a bowl over some boiling water or in a microwaveable bowl, in the microwave. If using the microwave, use a medium high setting, blast for one minute and check. When melting chocolate in a microwave, it is a bit odd, as although the chocolate might have melted, it still retains its shape. The look of the chocolate is the answer,mint is very shiny. DO not over heat. Stir to make it liquid and then beat in the softened cream cheese and then the egg yolks. Then carefully fold in the beaten egg whites, to fully incorporate them. Bake on the middle shelf for about 50 mins. It will probably have a crack on the top, but do not worry. Switch off the oven and leave the cheesecake in it, with the door open for about 20 mins and then remove and leave to cool. Unpan carefully using a pallet knife to help slide the cheesecake into a serving plate ( my spring pan is fibber on the outside with a ceramic bottom which also can serve, as a serving dish, makes life a little easier!) 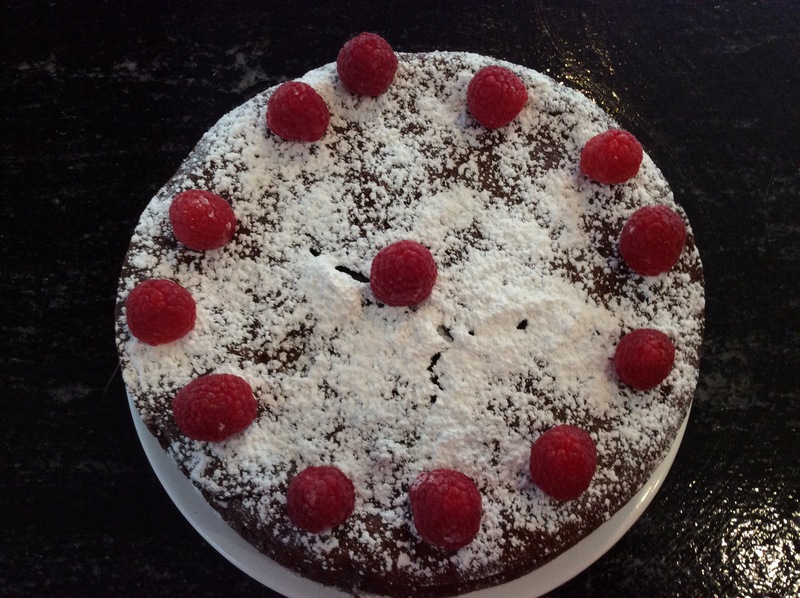 when cool decorate with icing sugar and raspberries, serve on its own or with vanilla ice cream! Be adventurous try using a milk chocolate for a lighter version or even white chocolate, quantities remain the same! Enjoy!! I am currently on an Indian kick, so tonight it was a version of Kedgeree or it could be an Indian Risotto. The word kedgeree is an English variation on the Indian word Khichri, and it is supposed that the colonial British brought the idea back from India, though there are records of it being in Britain, very much earlier than that. The traditional Britihs version usually contains smoked fish along with rice , hard boiled eggs, white fish and maybe shrimp or prawns. 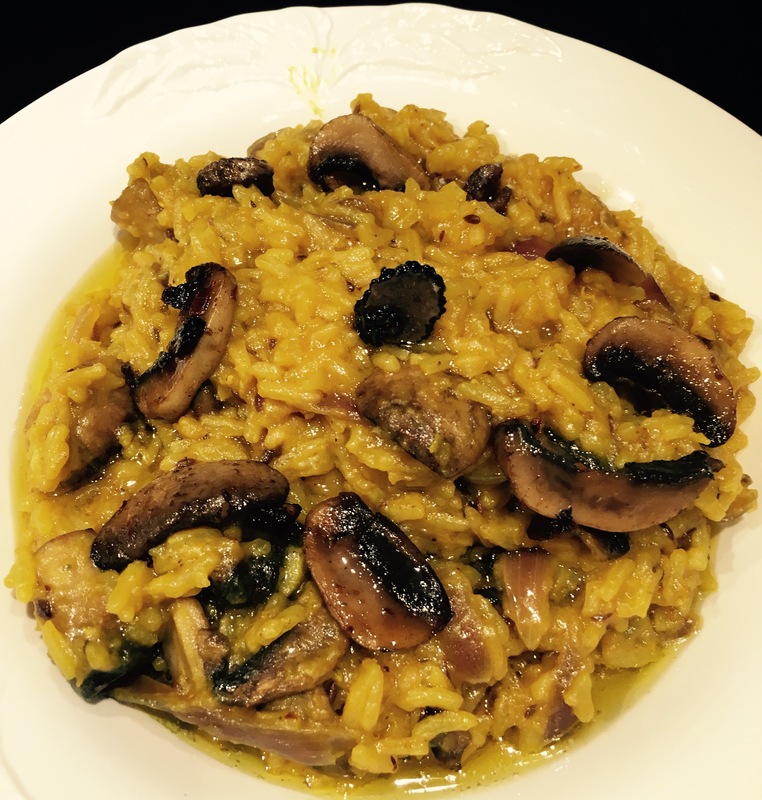 This version is made with lentils and rice with mushrooms. 500 grams mushroom sliced not washed but cleaned with a mushroom brush. Melt 2 tabsp ghee, add the cumin and toast/fry until it pops, add the garlic and the onion , sauté until soft but not brown. Stir in the lentils and the rice. Add the stock, turmeric and salt. Bring to the boil, cover and simmer for about half an hour. Add more stock or water to keep it to a risotto consistency. When cooked switch off the heat and keep covered to keep hot. Whilst the risotto is cooking heat the oil and add the garlic, sauté until soft but not brown. Add the sliced mushrooms and the chilli flakes and stir until the all of the liquid generated by the mushrooms have been absorbed.. Add all to the rice/lentil mixture saving a few for garnish. Melt the remaining ghee. Plate the risotto and pour over some of the melted ghee and garnish with the remains mushrooms. On returning to London from Mexico City it was to a cupboard bare. So after a trip to the local supermarket followed by another trip to Church St. market, I thought I would treat himself to a Mexican treat for Sunday breakfast. So it was going to be Poched eggs with a chilli tomato sauce. As mentioned in my previous blog I created a recipe for this Mexican delight. However I added some extras, which included some sauteed chopped red peppers, mixed in with the canned tomatoes mixture and whizzed to a fine purée . The was heated and if it was too thick I diluted it with some water. Instead of coriander, this time I used water cress ( which actually was perfect) . Again a soft poached egg ( or two) and some toasted sourdough bread. Unfortunately , I do not have the chipped enamel bowls in which to serve the breakfast, maybe on my next trip to Mexico, I will be able to hunt done the bowls. Meanwhile, I served it in some old Japanese bowls. Breakfast in Mexico City is an interesting affair. It ranges from the street stalls that cater to the itinerate workers, who come into the city in their droves, often leaving their homes long before dawn to ride one of the many, rickety buses, down the crowded freeways to work. There are food stalls on every street corner, but none more so than the areas around the bus stations.So from Street Stalls to high end Hotels Breakfast can last the whole morning. In the area known as Colonia Condesa there is an abundance of good middle of the road eating establishments. One of the new ones is Lardo and is open for breakfast, lunch and dinner, and I have been there morning and night and not been disappointed. 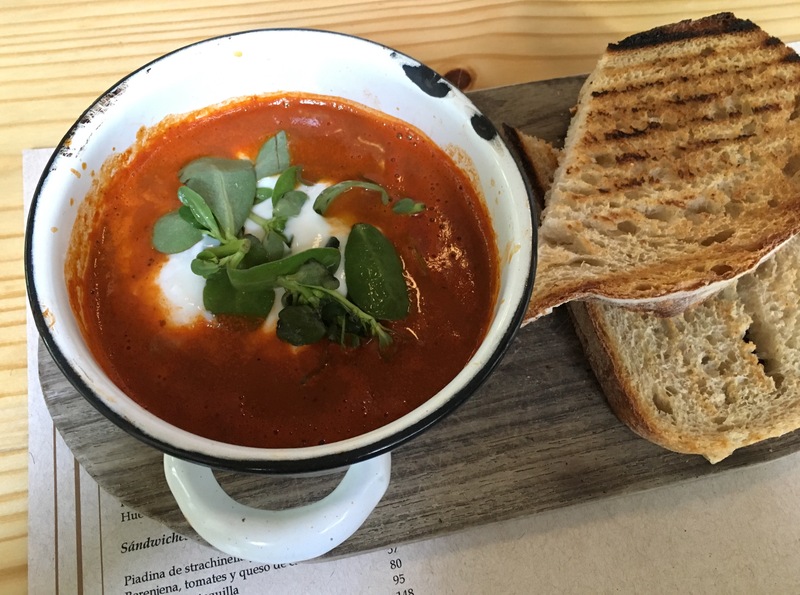 On my last visit the slender blonde said that one of her favourite breakfasts was “Huevo pochados pimientos,epazote y verdolagas” so translated poached eggs with tomato pimento sauce, Mexican herbs and purslane. Epazote is an ancient Mexican herb with a distinctive flavour and used widely in Mexico and Central America , it is sometimes called Mexican Tea. Purslane on the other hand originates in Central Asia, but has spread world wide. It grows just about everywhere, but I am not sure I have ever seen it growing, or if I did, I didn’t have a clue as to what it was. Many gardeners consider it a weed and a nuisance, as it goes to seed very quickly. But it is apparently rich in Omega 3, so maybe not so bad after all. However, both of these ingredients are not readily available in the local grocery store, so I have come up with alternatives.For Epazote I have substituted some coriander and for the Purslane a few sprigs of watercress . To make this sauce yourself, could take a little time and dedication, however there is a cheats version. For two people take a can of chopped tomatoes with chillies, a large white onion chopped, a couple of chillies de seeded and chopped and a few sprigs of coriander. Sauté the onion and chillies together until soft, add the can of tomatoes and Wizz altogether to make a smooth sauce. Taste and adjust the seasoning. My method of making poached eggs is simplicity itself. Boil some water in a pan with a dash of lemon juice, add the required number of eggs, carefully cracked , bring back to the boil, turn off the heat and leave for the whites to solidify. Remove from the pan with a slotted spoon. If you like your yolks firmer then leave in the hot water for a while longer. 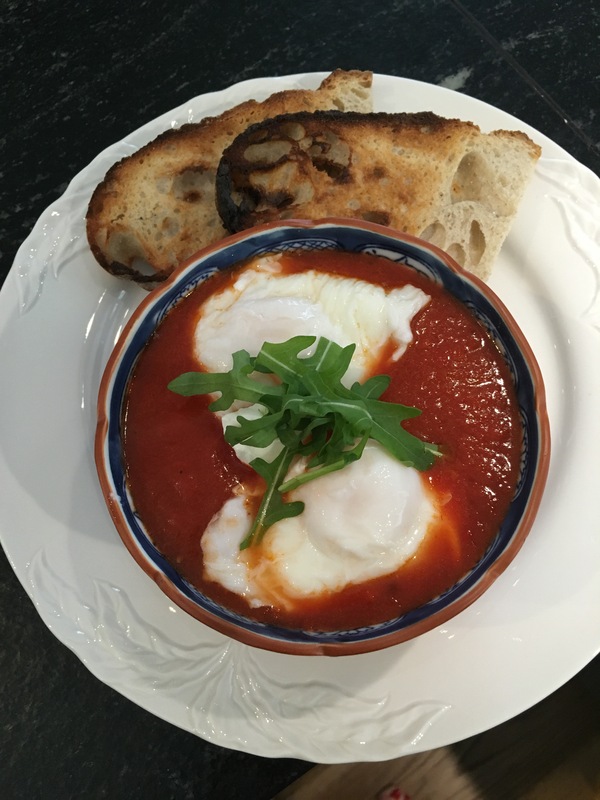 Heat the tomato sauce, pour into bowls add the newly poached eggs, top with a little sour cream and a sprig or two of watercress for garnish. Serve hot with freshly toasted sourdough bread!